Thick frost hanging from barbed wire proved too interesting to pass by. Sometimes a distraction becomes the main event. Here I was driving down a beautiful country road on a mission to find wildlife. The sun was shining and a fresh blanket of snow covered everything. It looked promising when I spotted a coyote and some deer quickly running away. I kept driving and hoping for an opportunity to photograph wildlife. The two-tracks-through-the-deep-snow trail became impassable so I turned right and headed down another snow-covered road. It was a winter wonderland with the sun dancing around the fresh snow and frost hanging liberally off trees and fences all around me. As the fence frost kept getting thicker, I decided this was one time when wildlife would have to wait. On closer inspection, the frost turned out to be fascinating. I was soon walking through deep snow looking for different perspectives of the most remarkable frost I had ever seen. It was a pleasant distraction. With the sun nearing the horizon and coyotes howling in the distance, it was time to head home. A few minutes down the road, I found a photogenic porcupine. Great day. Life so often turns out different than you plan. Frost hanging like bunches of grapes, somehow defied gravity while held together by delicate crystals. This is my favourite image. What was the centre colour that made the frost look like a flower? I discovered it was cattle hair that had been caught on the barbs and wound into a tight circle. Beauty from unexpected places. That second one is my favourite as well. Thank so much for the comments. Livng in Australia I don’t see much snow so love to head to cold places. Your images are exquisite. Glad you liked them. It’s funny because here a lot of people head to warmer places in winter. These ice crystals are splendid and I adore ! So glad you liked them. Thanks for commenting. WOW, a lot of stunning images , this one and all the others. Thanks so much. I’m glad you liked them. We’re expecting some wintery stuff here for a few days, doubt it will give as stunning subjects as you show here but … we never know. Our wintery stuff lasts a lot longer and I’ve never seen something like this before. So who knows you might get something better. Thank god for the ice and snow. If it wasn’t for that, I would have to stalk you and take over your life. You live in a very beautiful place! The winter and snow are absolutely beautiful at times and then difficult to cope with when the windchill takes your breath away. But then life is like that. I can understand that you typically don’t do your stalking through snow so I may be safe! Sorry for the delay in responding. Your comment got buried in spam – maybe it was the stalking part. Wow. Great shots! Thanks for sharing. Thank you. It was a beautiful scene. Thanks for your confidence. I was fortunate the planets aligned for me that day. Your day will come. Gorgeous – can I ask what lens you used for these. I love them! Of course. I used a Canon 70-200 2.8. I was zoomed out to 200 trying to avoid stepping into the deepest snow while still getting close. It was the shortest lens I had along that day and it worked out. Wow, I was thinking macro – great work. Stunning! I will swallow my angst and envy and regale you with tales of me stumbling about in my pj’s in hip-deep snow to capture a shot of thick frost on my neighbour’s fence. (Shots which never turned out at all, by the way.) *sigh* Now, had my neighbour caught me in said pj’s in hip-deep snow, THAT would make a great post! 🙂 Love how you caught the wonder and mystery of the unexpected here. That is a fantastic story. Just about the time you hit the deepest snow, you had to think that the odds of getting the shot were going down. It would have been a funny post. The things we do to try to get the shots. I have actually contemplated putting a post together of some of the missed opportunities but I think I’m still recovering from the frustration in too many of the cases. Wonder and mystery of the unexpected is exactly what I was trying to convey. Thanks so much for the comments and letting the angst go! The right is all yours. I will probably use mine in the pursuit of wildlife. As for results, I still don’t know exactly why these turned out so much better than my failed attempt to get snowflakes in the back yard. I’m not sure my interest in macro photography will recover. I’m sitting here chuckling about the fact that I have been trying to slide away from this whole envy thing and you keep coming back to it. I don’t know when or how I started a competition. So if we throw in poetry with the critters and I lose at that does it help? Immeasurably! 🙂 No, I’m good – just really impressed with your frost shots. There, are we back to fair footing now? Absolutely. Always fun to banter. They are all beautiful pictures! The last one is my favorite. Thanks. It was just one of those remarkable scenes that was better than any frost I had seen before. I could probably have gotten more photos like these but the sun was setting and I had forgotten my tripod at home. I was happy pleased these turned out. Thanks. They definitely made me stop and take notice. Well what do I say in response to that? I’m glad they struck a chord. just except it as a big compliment and keep the great work up. These are just incredible photos. I love the beauty of something man-made meeting nature. Thank you. I usually prefer all natural photos but, you’re right, there is something special about that intersection. Absolutely beautiful…so simple but so lovely. Great close up. Beauty often comes from the simple. Thanks for the comments. You really made something special out of the ‘frostyness’ (if I may use that expression) of the day. Wonderful view of the crystals and the juxtaposition with the barb wire is intriguing. I like the term frostyness. Glad you liked it (I know you really meant the cold). 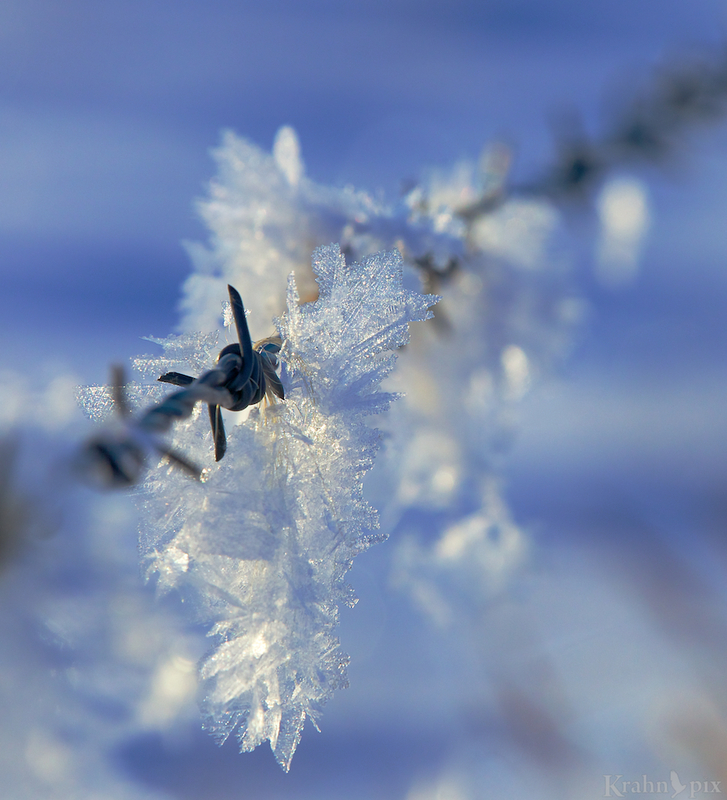 The barbed wire and frost have such different textures they really play off each other as you mentioned. Glad you liked them. Thanks for stopping by. beautiful shots, and a very nice story – indeed, sometimes unexpected beauty comes our way. it’s very nice how the frost seems to be hanging from the wire – and interesting that all of them seem to have some of that fur in the middle. maybe that facilitated the formation of the frost flakes? that also gives the pictures something more, as the yellow/orange of the fur breaks with the blueness of the ice. beautiful post, thanks for sharing! I think you may be right – the cattle hair probably helped facilitate frost formation creating the unexpected look of a flower. I’m still a little surprised that something as mundane as cattle hair could contribute so much. Appreciate the comments. Beautiful shots. My favorite happens to be the same one as your favorite. The shallow depth of field and the angle really drew my eye to the beautiful crystal structures of the frost. As usual, though, your words had as much effect on me as the photos. “Life so often turns out different than you plan.” Most of us could write entire books on that subject, but somehow we feel more secure if we make plans. That’s ok, I think, as long as we don’t feel compelled to follow our plans too rigorously. I need constant reminders that I am free to deviate from my plans and your blog did just that. Thanks. Thanks Mike. Perhaps the primary reason I wrote that line was to remind myself that I am free to deviate from my plans and it’s nice it resonated with someone else. And you are so right about feeling more secure if we have plans. It’s surprising what you find when you look around. So very true! And is that not the thing we love most about nature…..the unexpected? Because it often turns out better. It’s usually hard for me to predict what the “main event” will be when going into nature. The good thing is there always is one and it’s often unexpected. You’re absolutely right but I like to plan to at least to give me an illusion of control. The key is to be open for the inevitable unexpected. As always, such beautiful images. Just yesterday, I was admiring a local photographer’s images of a “Frosty Cades Cove” (famous location here in The Great Smoky Mountains National Park) and noticed she referred to the “rime frost” or “rime ice”. I admit I had to look that up. I’d always heard of “hoar frost” but never “rime frost”……seems I’ve had my head stuck in a pumpkin somewhere, because it is a well-known term. Silly me! Well, whatever it’s called, I love your pictures of frost on a fence. Thank you for bringing such beauty to our eyes! Happy to share and glad you like them. It was fun to be there. I’m not familiar with the term rime either so maybe it depends where you are from. Having built and repaired barbed wire fences while working as a cowboy, these have special meaning to me. Thanks. Most welcome. Our past certainly affects the lens with which we view certain things. It was a lot of fun to stumble on this creative beauty. No need. It was a beautiful sunny day!